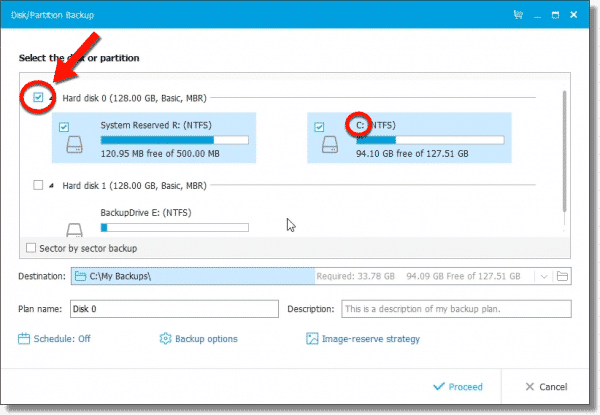 Creating a Backup Image Using EaseUS Todo Free - Ask Leo! Microsoft is apparently removing image backup capability from Windows 10. We'll make an image backup using a third-party alternative. There are three things to note about the download and install. First, you will be repeatedly offered the opportunity to choose their retail product, or a trial version of their retail product. These products are not free. They’re also not needed for what I’m about to show you. Sometime later, you can return and upgrade to one of their paid offerings if you like. Be very careful, and make sure you always and only choose the truly FREE version of EaseUS Todo. Second, you will be asked for an email address. In a sense, this is the “cost” of the free edition. I have no complaints with EaseUS email, and you can always unsubscribe later. They do frequently offer discount codes for their retail product, so if you think you might be purchasing at some point in the future, it’s worth getting on their list. Finally, like most free software, be on the watch for PUPs. EaseUS does not hide the additional software offered with Todo, but it is selected by default. Be sure to deselect it during the install process. 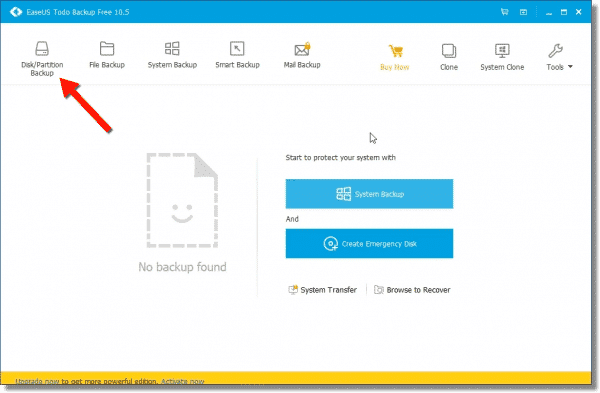 Run EaseUS Todo, and on its main screen, click on Disk/Partition Backup. 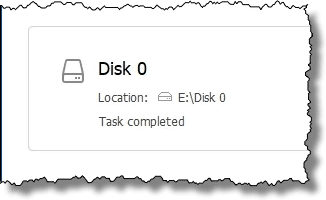 I choose this over “System Backup” or “Smart Backup” because it provides explicit control over the disks and partitions included in the backup image. On the resulting screen, check the box to the left of the disk that contains your system or C: partition. This will ensure that the entire hard disk that contains your system, including any additional partitions (such as recovery partitions), will be included in your backup. Next, click on the small folder icon to the far right on the “Destination:” line. This will open a folder selection dialog box. Use that box to select the destination: the folder, typically on your external hard drive, into which the image backup is to be placed. Click OK to accept your selected destination folder. Click Proceed to begin the backup. Naturally, this will take some time. Exactly how long will depend on the speed of your system, the speed of your hard disks, the amount of data to be backed up, and more. I will point out that EaseUS Todo’s “Estimated time remaining” indicator is notoriously inaccurate. Open Windows File Explorer and navigate to your previously selected destination, and you should find a “.pbd” file. That file contains the image backup of your system. Restoring an Image Using EaseUS Todo - You have an image backup and an emergency disk. Here's how you restore that image to your computer. 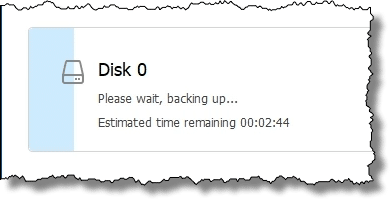 Creating an EaseUS Todo Emergency Disk - Before you can restore a backup image created using EaseUS Todo, you'll need an emergency disk. « Previous post: How Do I Edit a Reply? Windows 7 backup for 8 years.) Can you explain how to restore the Image backup after one has been made. Have patience. It’ll come. The most important step is to create the backup. Once you’ve created the backup, it’s there ready to be restored when needed. As always, an excellent helpful presentation. I note that Sector by Sector has not been activated. Do you recommend activating it for a Disk Partition Back up? & if you do, what function does it actually undertake? In previous articles, Leo has recommended a system image backup over a sector by sector backup (AKA clone). A system image has everything you need to restore your system and takes up much less apace as it only copies data necessary for restoring your system, and it compresses the data. A sector by sector backup would be useful if you wanted to be able to swap in the backup copy instead of performing a system restore. That wouldn’t be practical if you use an external drive. You’d need to back up to something like a hard drive in a USB enclosure for that. I been using MacriumReflect free edition as you recommend and now I see other application EaseUs Todo. My question to you is, do you still recommend MacriumReflet? Leo hasn’t dropped his recommendation for Macrium Reflect. 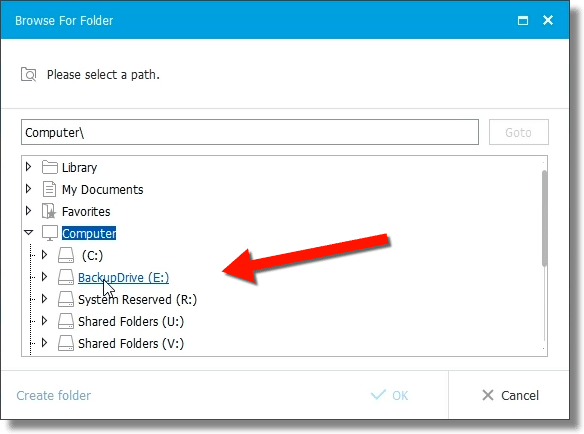 EaseUS Todo is an additional recommendation, because it allows incremental backups with the free edition. Have you done a similar article like this using Acronis True Image? I see the reviews are YEARS old and Acronis has improved their product since then. It might be time for Leo to consider taking another look at this application and consider doing a current review of it. Just a suggestion! Have you had any experience with their help desk recently? It was one of the problems. My main gripe is that you have to provide an e-mail address just to be able to download the free version. Is there a way around this, or am I stuck? 1. It is a great tool for websites to rule out spam. Very often a site asks for an email, and then requires the owner to verify that they own the email. This makes sure only real people are requesting the service, and it eliminates bots. 2. It gives the legitimate business a way to communicate with you. If you are using their free service then that’s not too much to ask. If it is some sort of software then it allows them to let you know when upgrades are available, or if there are any issues. A legitimate business will always provide a way for you to opt out of receiving emails, later, if you decide you don’t want that. It’s not a bad idea to use a separate email address for free offers. I opened one as a throwaway address years ago and I still haven’t had to ditch it for spam. It’s not an insult to the company. It’s my dedicated email acount for free offers and newsletters. It also serves as a recovery email address for other accounts. a) EaseUS actually behaves properly. You can opt out later. c) As Mark said, it’s also good practice to have a separate throw-away account for just this kind of thing. d) there’s no such thing as free. Providing an email is the price. If that’s not a price you’re willing to pay, that’s OK, and you might consider looking for a different product. This is a variation on Alan’s note. I have a multi TB drive and have partitioned 30Gb of that to a “C” drive. It’s physically located at the front of the hard drive. I wish to create several images of the C drive to smaller (60 GB) hard drives. Can I specify the “C” partition to be backed up to the smaller drive with a sector by sector backup so the back up drives are usable as system drives? If not with EaseUS Todo, can Macrium Reflect or another backup program do it?